Today’s headline, Anti-Ageing Breakthrough’s, comes from a subject line on an email I received this week from a major online cosmetics company. It annoyed me so much, I had to write a blog post about it. Given their subject line, I wasn’t surprised when I read in the body of the email that their products could help “restore your skin to it’s [sic] most youthful state”. As I’ve often repeated, a relative 20 years my junior retorted when asked why well educated professional people made so many basic grammatical errors these days, “What’s the problem? We know what we mean”. It’s true. I do know what that cosmetic company’s subject line means. But I’d love to know the rationale behind putting an apostrophe in such a straightforward plural. On this topic, I once queried a student of mine, who did excellent work but who always used apostrophes with simple plural’s (like that). When I asked him why, he said he didn’t know and that he’d never thought about it. Another teenager told me they were taught at school to put apostrophes “with s words”. Could this be true? It can be the only answer. I can understand some confusion about its and it’s: the possessive version is an exception to the usual in NOT taking an apostrophe, though it’s easily explained (use it’s only when you mean “it is” or “it has”). I can understand the coffee-shop blackboard error, cappuccino’s $4, it being a ‘foreign’ word and all (the plural is cappuccini if you want to be strictly correct, but it has become anglicised in Australia to cappuccinos). I can even understand another one I saw recently, holiday’s (the writer knows that words ending in –y often become –ies in plural, but holidaies is clearly impossible, so the writer has become confused). 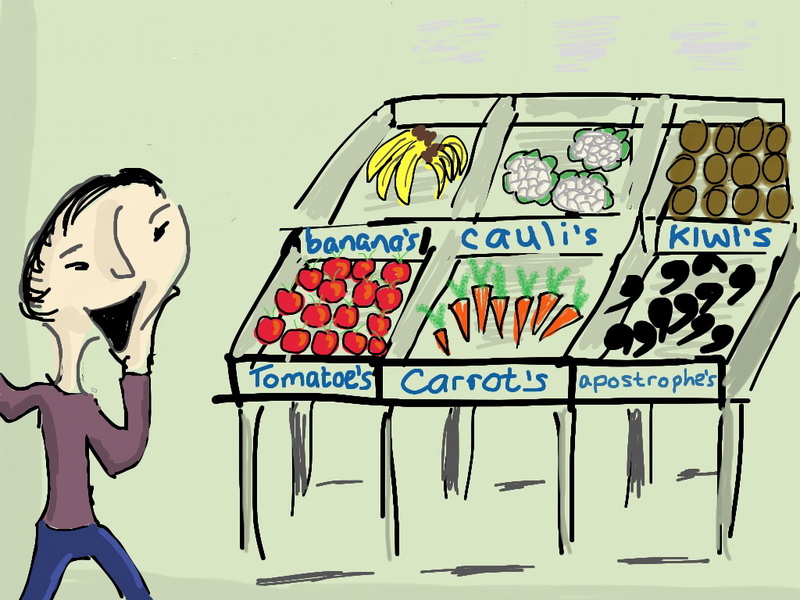 There’s the old joke about the grocer’s apostrophe, depicted so well in the illustration on this page (thanks to Juliet Fay for allowing me to use her cartoon, and you can read her excellent blog post on such apostrophes here). While we all make errors in our writing and informal correspondence, through haste, a casual approach, or the fact that our work isn’t edited by anyone else, I’d expect professional companies to be just that. To me, it looks unprofessional when I see grammatical errors in publicly released advertising or editorial material, and I wonder in what other ways the company is unprofessional. Get a good sub-editor, or just someone who knows basic grammar, to check the work of your copywriter, companies! Or am I asking too much? Does it even matter?